It had been a while since I read the second in this series, The Elite, and longer still since I read the first, The Selection. But when I saw this in the library, I knew I should probably read it. And I'm glad I did. I really like these stories, and while it's not my favourite YA series, I definitely wanted to keep reading it, and seeing where America's story went. If you're unfamiliar with the series, it follows the story of America Singer who lives in a future world, which is similar, but not quite the same as our own (World War Three has already happened and is a part of their history lessons). The Selection is a process in which girls of a certain age can put their names forward in hopes of becoming one of 35 girls that will move to the Palace to try and win the Prince's heart and his hand in marriage. 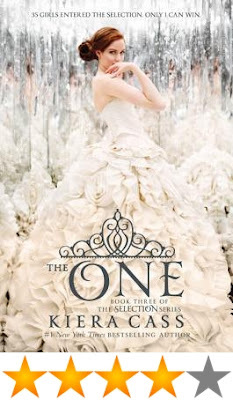 In the Elite, she's one of 4 who are chosen, and are that much closer to becoming America's Next Top Model to winning the heart of Prince Maxon. The One continues her story, and the 4 Elites are still trying to get Maxon to ask them for their hand in marriage. But as well as all these princess-y duties they have to perform, there are rebels from all sides of the country trying to get into the palace, there's heartache and grief, there's secrets and alliances formed, there's death. But there's also laughter and love and friendship, and it was great to see America making some good decisions in this book. I definitely liked her more after reading this than the other two books. If you've heard about this series, but haven't picked it up yet, do give it a go. It's a fun series with a lot of crazy characters, and it's about princesses. What's not to love? The fourth book is called The Heir, but I have yet to read it. It came out earlier this year, so I'm looking forward to reading that at some stage. Our New Favourite Bookish Website!